Earlier this week I presented to the Canadian Chamber of Commerce here in Hong Kong on the topic of SEO. In my slides, I spoke about how easy it is to get good rankings for certain terms in Hong Kong because companies here generally are behind when it comes to SEO. As a case in point, I brought up MWI’s Hong Kong website, the one you’re reading right now. If there is any search term that should be highly competitive, it should be something related to SEO, right? After all, SEO firms should be doing all sorts of work on their own sites to get them ranking well, arguments about the cobbler’s children having no shoes notwithstanding. Soon after my presentation one of our team members who attended nervously asked me if the screenshot I had used in my presentation was out of date, because he had done a search on Google on his phone, during the presentation, and found that MWI was not showing up at #2, as I had claimed and shown, but was in fact showing up at #5. I pulled out my phone, performed the same search, and got results that matched his. Here’s what showed on my phone. Actually, a lot less than that showed on my phone. I had to scroll down three screen heights in order to down to MWI’s #5 place listing. Did the results change in between when I took the screenshot on my computer and put it in the presentation, and when I checked the search results on my phone after the presentation? Turns out they didn’t change at all. The screenshots above were taken just now, seconds apart. One difference was that one search was performed on my desktop computer, and the other on my phone. But this wasn’t the only difference. The more important difference was that I was performing one search, on my desktop, using google.com, whereas my phone was defaulting to google.com.hk. When I switched my desktop to use google.com.hk, MWI went down to the #5 spot on my desktop, just where it was on my phone. In other words, search results can and often do differ from one country version of Google to another. This only makes sense. Someone using Google.com.hk is probably living Hong Kong, whereas someone using Google.com might also be in Hong Kong, but is perhaps just visiting. But Google doesn’t change search results based on probable cause, but on data. The different search results are almost certainly because Google has tested user behavior on Google.com vs. Google.com.hk and the data shows that the search results wherein MWI shows up at #5 produce better results (for Google) than if the search results matched what is shown at Google.com. 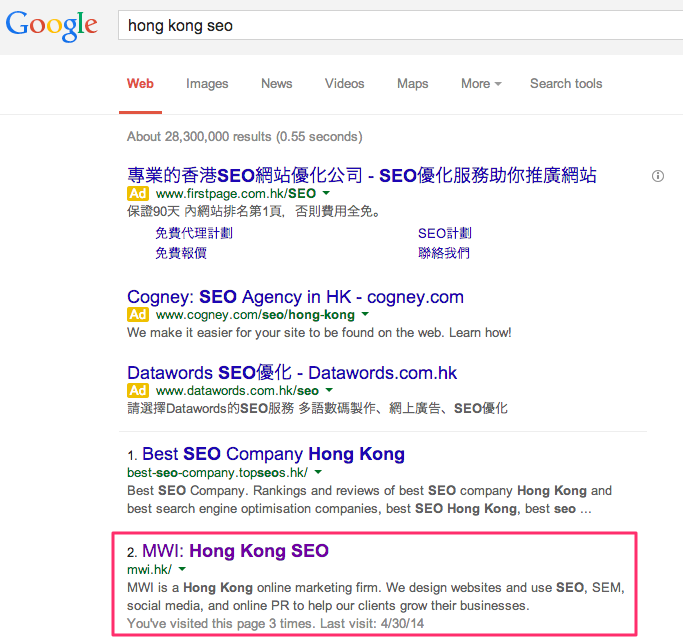 This being the case, of course I want to raise MWI’s rankings on Google.com, but just as much, if not more so, on Google.com.hk, which is likely what much of our target audience is using. How will we go about doing that? There are two specific changes that can be made. Schema location markup. This is something we’re working on. Set your geographic targeting in Webmaster Tools. This was already done, in our case, so no improvement to be made. 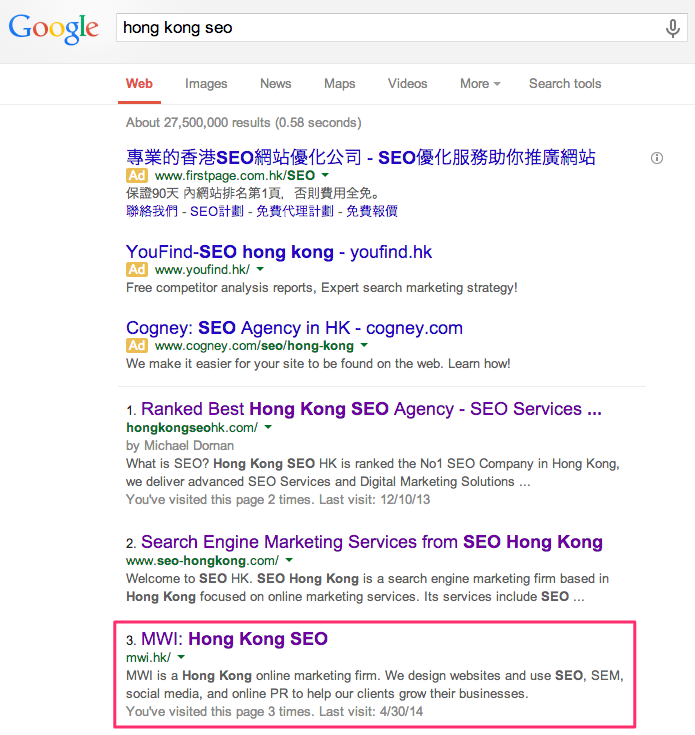 Making these changes doesn’t directly affect rankings, per se, except that it can tell Google more accurately where MWI Hong Kong is based, which could theoretically lead to indirect improvements in rankings for Hong Kong related search terms. Other than that, it’s the same ol’ SEO story. We write content about online marketing in Hong Kong, we get high quality, relevant links from Hong Kong websites, and over time we know we’ll move up. In fact, as of finishing this post, we’ve now moved up to #3, so we’re making progress.